Moisture is one of the most challenging issues that can affect door appearance. If you apply the correct finish treatment, your doors might be able to stay as neat as the day they were installed. Some doors might dry depending on the environment in which they are installed, as the moisture inside them evaporate when they are installed at drier places, and so the door will shrink and warp. However, there is always something you can do to prevent that from happening. There will be times that as opposed as described above, the door will be installed at a more humid location causing additional problems such as swelling and warping issues too. During winter, many builders will be asked for warranty issues as the doors will warp when the furnace is running, so it dries out the moisture out of the air affecting the moisture content of your door. Also when the door is finished on only one side or has different finishes on both sides, then the door might start to warp. Now that you know why doors warp let’s work together to find a solution to this problem. Start by storing the doors in the same environment and if possible at the same room in which they will be installed for about 36 hours before installing them. Lay the door as flat as possible and apply two coats of finish over all the door’s six edges. Do not save money by applying only one coat as it would not be enough and the door might warp eventually. Be sure to apply the two coats over the top and bottom portions of the doors, as these might be the most critical or the place that would be more exposed to humidity. The first step before applying the coat is to lay them down on a flat surface. Provide multiple support for your doors to avoid curvatures on the door. When a door is not properly supported, the actual moisture content of the coating will make it take the shape of the position. 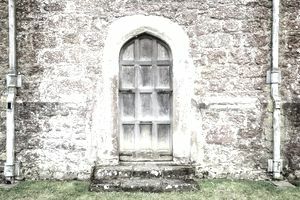 Do not lean the door against a surface as it might bow to, having you with a useless door that eventually will not fit. Remember to apply the same coating to all 6 sides of the door to reduce the probability of warping, not only once but twice. If you are choosing the type of door that you want to use, consider using a fiberglass one instead of a wood door. Try to get a door that is weather resistant, and that can withstand temperature variations. Are There Doors that Won't Warp? The answer is yes. There are many products or door options that will not warp when exposed to humidity changes. A common door, if manufactured properly, can be designed so the warping effect might be addressed by the way it is assembled. A door can have vertical rails made out of two separate pieces of wood, which are laminated together with the grain running in different directions. The stile needs to be assembled the same way so when the moisture gets into the door, it will bow in opposite directions canceling the warping effect. Steel, aluminum and fiberglass doors will not warp making it ideal in some instances to have them installed.